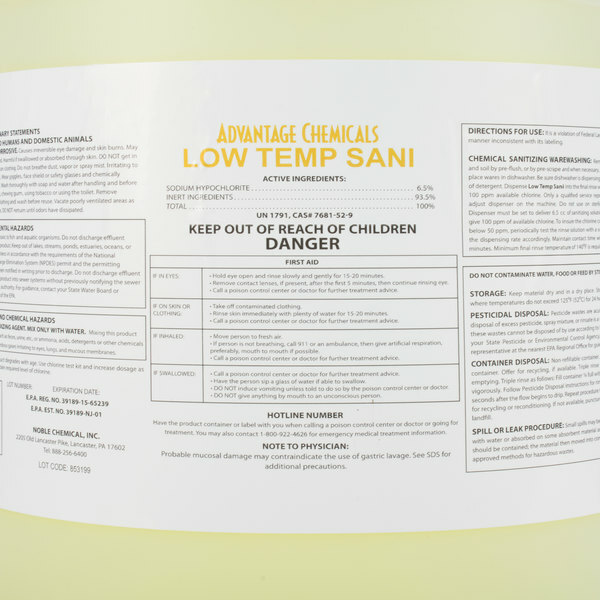 Keep dishes sparkling clean and sanitized with this Advantage Chemicals 5 gallon low temperature dish washing machine sanitizer. Great for kitchens in restaurants, hotels, and hospitals, this sanitizer is intended for low temperature dish washing machines. Convenient and easy-to-use, this sanitizer takes the hassle and guesswork out of sanitizing your dishes. Connect the container to your unit and move on to other tasks as your dish washing machine takes care of the rest. "This sanitizer does what it is supposed to do and works great with the dishwasher we purchased from this site. Easy to use and feeds directly into our machine." For added convenience, this unique product is formulated to be dispensed through an automated injector system, assuring the lowest possible use cost. 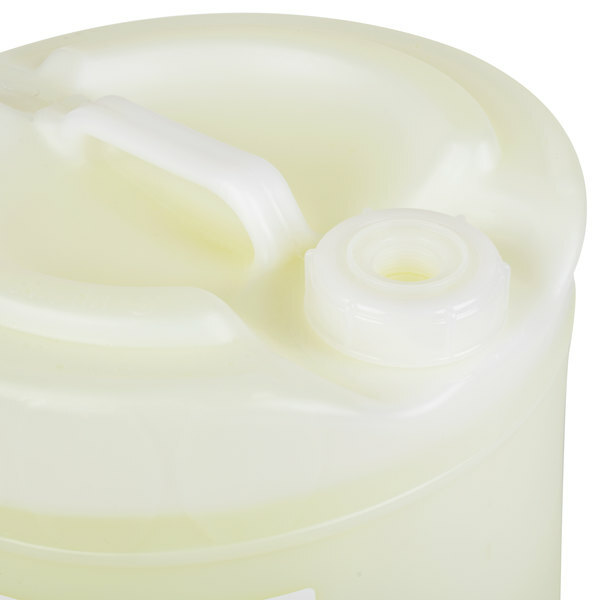 Simply open the container and insert the sanitizer pick up tube into the container opening. With everything in place, the sanitizer is automatically dispensed into the machine. When the container is empty, simply replace it with a new one to continue santizing dishes with your low temperature dish machine. 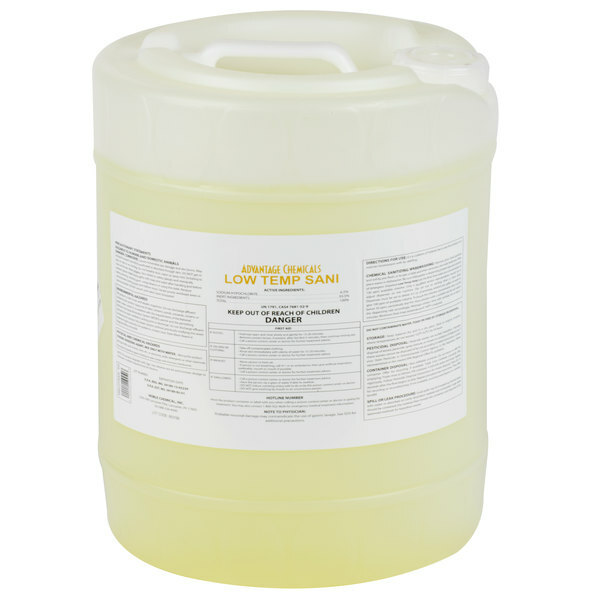 This low temperature sanitzer is a buffered product, which means it contains a high level of free alkali to enhance its stability when compared to other chlorine products. Due to its concentrated nature, this sanitizer effectively santizes tableware at 100 ppm. It is safe for use on stainless steel, glass, china, porcelain and plastic. However, it is not recommended for use on sterling silver, silver plated items, or other soft metals. 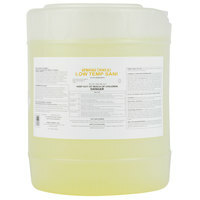 This sanitizer comes in a bulk 5 gallon container to keep your facility in good supply as you wash your dishes. 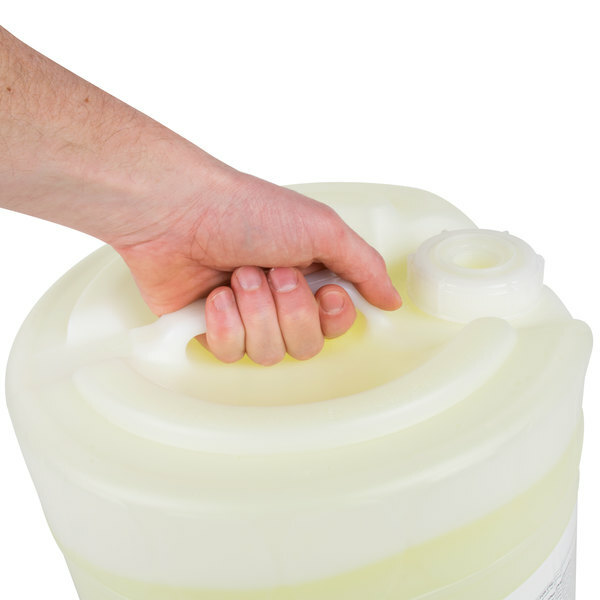 Great for transporting this sanitizer around the kitchen, this handle provides a secure grip as you move it out of storage to connect it to your machine. Sometimes product descriptions can be a bit off so I was a little weary of buying this. What I can say for sure is that the product descriptions on Webstaurant are far from being wrong. This product works better than the description and it was easy to install. It gets the job done and I wouldn’t purchase another brand of dishwasher soap. This sanitizer gets the job done. I have found I needed to adjust my dishmachine to add more liquid each cycle to get the right ppm but at this price it is still less expensive per load than what comes from Cash N Carry. This sanitizer works great with our dishwasher and costs 1/5 of what my food suppliers were charging me. I am glad I found this site! 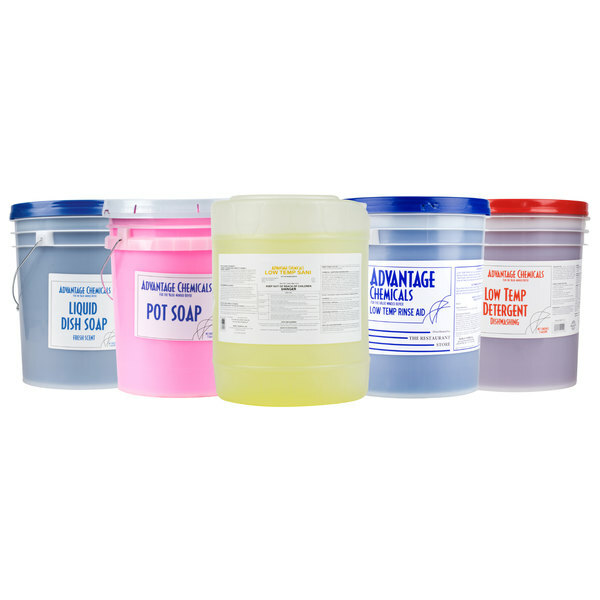 The Advantage Chemicals 5 Gallon Low Temperature Dish Washing Machine Sanitizer is a great quality product for an unbeatable price. You can definitely save a lot of money by buying in bulk. You can't go wrong with this product! 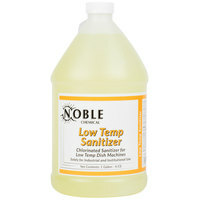 This Sanitizer is a great value and seems to work just as well or better than our previous supplier which was very expensive. So do your bank account a favor and try these advantage chemicals. 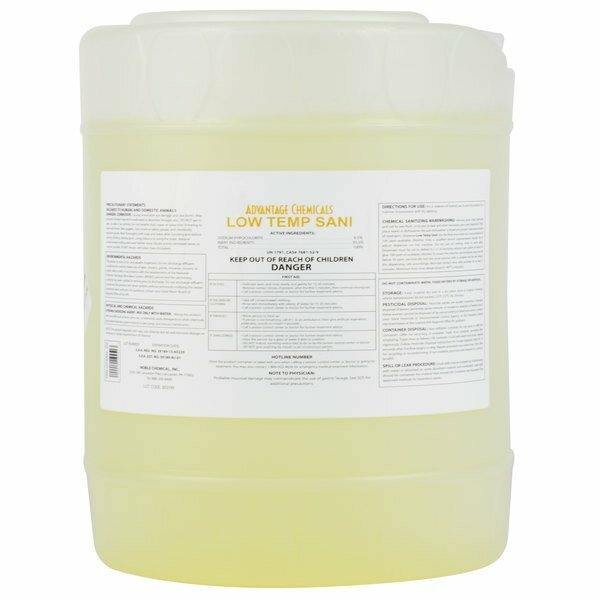 You can spend 3-4 times as much on the "best" brand (___Lab) or get the same chemicals from the Webstaruant Store without the big name. 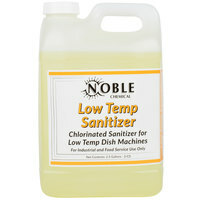 This sanitizer does what it is supposed to do and works great with the dishwasher we purchased from this site. Easy to use and feeds directly into our machine. 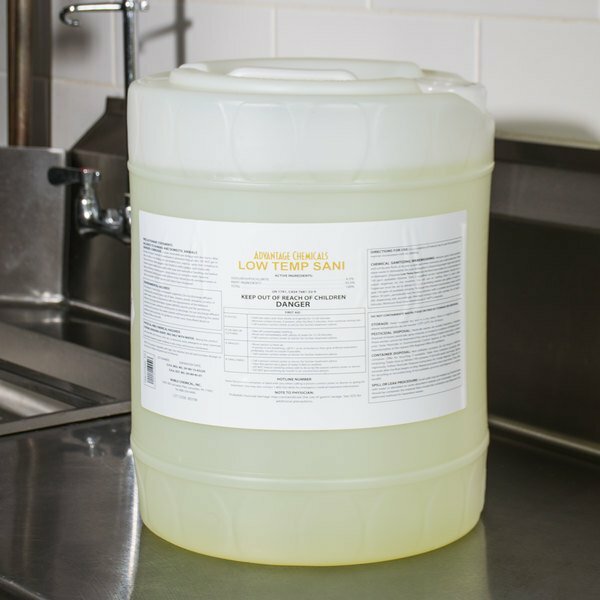 Make sure that all your dishes are not only clean but that they are sanitized properly with this large 5 gallon low temp machine sanitizer!! !